Breezy throughout the day and foggy starting tonight, continuing until tomorrow morning. Vineyard Haven Harbor is nestled south of Cape Cod in the beautiful green-blue waters of the Atlantic Ocean. Vineyard Haven Harbor is Marthas Vineyards main port and also the largest harbor on the island. It is located just less than 6 miles off the coast of Cape Cod's Falmouth Harbor. Named for its abundant wild grapes, Marthas Vineyard and subsequently, Vineyard Haven was once a home for whalers, smugglers, and pirates, but now teems with summer tourists and well-to-do year-round residents. Drawn by the relatively cool summer temperatures, fishing, excellent sailing and beach-going activities, Marthas Vineyard is one of the biggest yachting destinations on the U.S. East Coast. Explorer Bartholomew Gosnold, who also was the first to set foot on Cuttyhunk Island and the town of Westport, MA, arrived in Vineyard Haven in 1602. At the time, the Wampanoag Nation had populated the area around Vineyard Haven Harbor. Much of the Wampanoag Tribe faced disease and their land was sold to new settlers. Whaling took center stage in the 1800s and whaling captains reaped enormous profits from the sale of their whaling oil here. After the Civil War, the long decline of the whaling industry led to a booming tourist industry, which still remains today. 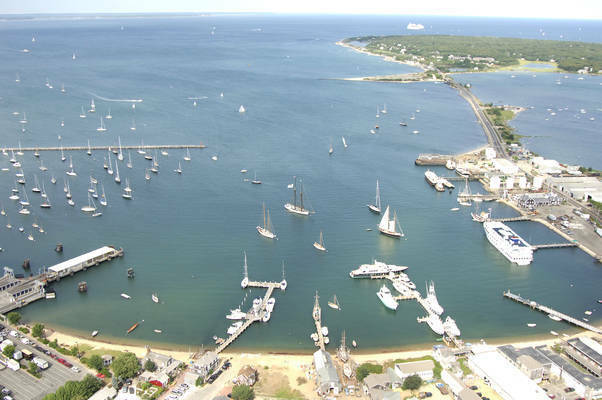 Vineyard Haven Harbor served as a stop for ships running from Boston and New York during dangerous conditions. Much of the commerce in town served ship repairs and provided supplies for the transient shipmen. In 1914 the Cape Cod Canal opened and reduced traffic from ships through Vineyard Haven Harbor. 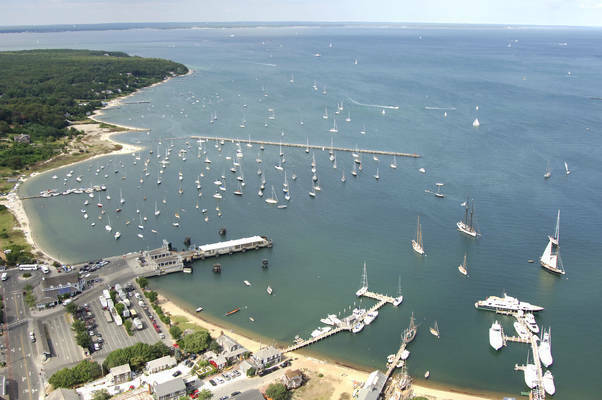 During World War II Vineyard Haven Harbor was utilized to construct vessels for the war effort. Use NOAA Charts 13237, 13218 and 13238. Vineyard Haven is entered through Nantucket Sound, either from the east or west. The 84-foot-high West Chop Light, along with two nuns and a gong buoy mark the rocky areas on the western side, while East Chop Light and several buoys mark the eastern approach. Marthas Vineyard does not have any regularly scheduled commercial air service, but charter flights are available to and from the island to New Bedford, Providence, Hyannis and Boston. Ferry service is available to Vineyard Haven via Hy-line Cruises or The Steamship Authority. Vineyard Haven Harbor has access to great nearby attractions and sites. Downtown is just steps away from Vineyard Haven Harbor. Make sure to take full advantage of the great shopping, restaurants, and cafes during your stay. No reviews yet! Be the first to write a review of Vineyard Haven Harbor.